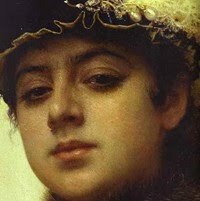 Biography of Ivan Kramskoi, Paintings of Russian Portrait Artist. A masterpiece of Russian Art. One of the best portrait artists in Russia, and one of the leading contributors to Russian Painting in the 19th-Century, Ivan Nikolayevich Kramskoy (Kramskoi) painted many of the most important celebrities of his generation. Highly prolific, an expert draughtsman and painter, he is associated with the Realist and Humanist movements. One of several great Russian artists of the pre-Revolutionary era, his contemporaries included Nikolai Gay (1831-94), Vasily Petrov (1834-82), Nikolai Yaroshenko (1846-98), and Ilya Repin (1844-1930). Kramskoy was a prominent figure in a minor revolt by some of Russia's most talented art students against the conservatism of the Imperial Academy of Arts in 1863, which led to the formation of the Society for Itinerant Art Exhibitions, whose members (known as peredvizhniki, itinerants, or wanderers) travelled around Russia preaching political reform and holding art exhibitions of works completed en route. Kramskoy's most famous paintings include Portrait of Leo Tolstoy (1873), Christ in the Wilderness (1872) and Portrait of an Unknown Woman (1883), all in the Tretyakov Gallery, Moscow. Born in Russia in 1837, Kramskoy taught himself to draw as a young child. At the age of 15 he became an apprentice to an icon painter with whom he acquired the rudiments of paint and perspective. Russian Icon paintings were commissioned primarily by the Church and were produced for spiritual purposes rather than art for art's sake. Icon painting typically disregards the principles of natural perspective; instead the subject figures are presented flat, with almond shaped eyes, long thin noses and small mouths. It is tempting to think that Icon painters simply did not know how to paint, but in fact it was a conscious style. Following the traditions of Byzantine art, icon-painters used the principles of inverted perspective, where background objects often appear larger than foreground ones and painted important figures larger than lesser figures. Icon painting encouraged the use of simplicity, grace, symmetry and symbolic colours. It was only in 1857, at the age of 20 that Kramskoy finally had the opportunity of obtaining a formal art education, when he was accepted into the Imperial Academy of Fine Arts, St Petersburg. The Academy had strong traditional values, and promoted the principles of Neoclassical painting by sending the most promising Russian painters to Italy and France to absorb the styles of the Renaissance and Baroque. It also had a sizeable collection of masterworks which were intended for study and copying. Kramskoy, quickly dissatisfied with the restrictions on his artistic development, became a popular leader among the student fraternity, and led a rebellion against the Academic staff. The Academy was dominated by the doctrines of French Neoclassical painter Ingres - so-called Academic art - while the students demanded freedom to explore realism in their painting. Led by Kramskoy, 14 students publically broke with the Academy and started their own group, holding traveling exhibitions. Many of his contemporaries, including the great historical genre-painter Ilya Repin and the Symbolist and Impressionist painter Mikhail Vrubel (18561910), still regarded the Academy's training as indispensable, and stayed within it's confines. Kramskoy's first paintings from the 1860s are not particularly large, and are often monochrome, reflective of the new art of photography which was gradually becoming popular. Examples of his portrait art from this period include Sophia Kramskaya Reading (1863, Tretyakov Gallery, Moscow); Portrait of a Young Woman Dressed in Black Velvet (1863, Art Museum, Kuibyshev, Russia); Portrait of E. Vasilchikova (1867, Perm Art Gallery, Russia); Portrait of V. Voyeykova (1867, Museum-Estate of Polenov, Russia); Self-Portrait (1867, Tretyakov Gallery) and Portrait of the Agronomist Vyunnikov (1868, State Museum of Byelorussia, Minsk). Between 1863 and 1868 Kramskoy taught drawing at the Society for Promoting Artists; his pupils included Nikolai Yaroshenko and Ilya Repin. In 1869 Kramskoy made his first trip abroad, travelling to Europe and visiting the fine art collections of the best art museums. On his return, he organized exhibitions for the Itinerants Society of Travelling Exhibitions (peredvizhniki). The aim of the Society was to give the general public a chance to view some of Russia's contemporary paintings; to develop a passion for Russian art in society and to facilitate the sale of those art works. The exhibitions travelled throughout Russia, stopping at towns and cities. Kramskoy also painted a number of religious paintings based on themes from the New Testament. In 1872 he painted Christ in the Wilderness (Tretyakov Gallery, Moscow). It depicts Christ sitting in a state of profound dejection and indecision, hands clasped due to tension not prayer. Leo Tolstoy described it as the best Christ he had ever seen. Another masterpiece is Mocking Christ: "Hail, King of the Jews" (1877-82, Russian Museum, St Petersburg). Kramskoy died in 1887, paint-brush in hand as he worked on the portrait of Doctor Rauchfus.  For details of major art movements in Russia, see: History of Art. 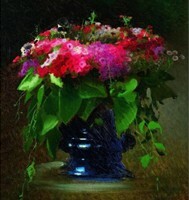  For more information about Russian portrait painting, see: Homepage.